‘NEVER AGAIN’ Association members and friends were in attendance at the European Medal of Tolerance ceremony held in London on 9 March. 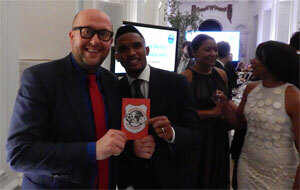 The Medal was handed to international football legend Samuel Eto’o and to the FARE network of which ‘NEVER AGAIN’ is a founding member. The distinction is awarded by the European Council on Tolerance and Reconciliation (ECTR), established in 2008 by former Polish President Aleksander Kwasniewski and European Jewish Congress President Moshe Kantor. Speeches in honour of the award recipients were made by Vaira Vike-Freiberga, former President of Latvia and Rita Sussmuth, former Speaker of the German Bundestag. The event was held at the historic venue, Kensington Palace in London. 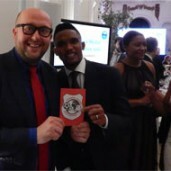 While playing for FC Barcelona in 2006, Samuel Eto’o had initiated a memorable on the pitch protest against racist chants. During his career, the Cameroonian international has also played for other clubs including Inter Milan, Anzhi Makhachkala, Chelsea FC, and Sampdoria. The medal for the FARE network was received by the network’s Chair Howard Holmes accompanied by other members of the FARE board. – ‘I am proud and happy for NEVER AGAIN to have contributed to this award’ – said Dr Rafal Pankowski, a co-founder of the ‘NEVER AGAIN’ Association and vice-chair of the FARE network. The ECTR is comprised of former European leaders and other public figures. It is an opinion-making and advisory body on international tolerance promotion, reconciliation, legislation and education. The first recipient of the European Medal of Tolerance was King Juan Carlos I of Spain. Joint recipients of the second Medal were the President of Croatia Ivo Josipovic and the former President of Serbia Boris Tadic. FARE is a network that works across all levels of football to advance social inclusion. It was founded in Vienna in 1999. The ‘NEVER AGAIN’ Association is an anti-racist educational and monitoring organization established in Poland in 1996. It is the FARE network lead partner in Eastern Europe. In cooperation with UEFA and FARE, it implemented the UEFA Euro 2012 ‘Respect Diversity – Football Unites’ programme.